"When the bread became too hard, my dad would put a hole through it and use it as the ball to practice headers." It is unlikely that many football stars of today would copy Paddy McLaughlin's training regime. 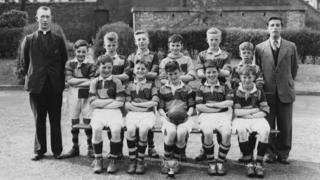 But back in 1954 it enabled him to help Holy Cross Boys win the Northern Ireland Schools' Cup for the first time. Now the school has published a book commemorating the feat. The Boys of '54 tells the story of the school, the team and also reflects on the history of Ardoyne in north Belfast, where the school still stands. It will be used to teach the current pupils about the history of football in the school and the history of where they live. Learning resources and activities will also be developed around the book in both maths and English lessons. Some of the survivors of the successful team of 1954 - like Paddy McLaughlin - have contributed their memories. Gerry Maguire, the teacher in charge of the team, also kept a diary of the team's progress through the seven rounds of the competition. "A workman from the Beltex factory wheeled a barrow load of the white stuff for marking the pitch over to the school," he wrote prior to their win in the first round against Mountcollyer in October 1953. "What a football exhibition our lads gave!" he wrote after the 4-0 victory over Everton school in the next round. The team went on to beat sides from Belfast, Coleraine, Larne and Portadown on their way to the final. Facing them on Easter Monday 1954 at Cliftonville's Solitude ground were the favourites Belfast Technical College. Belfast Tech had real football pedigree and Northern Ireland legends Billy Bingham and Danny Blanchflower were among their former players. But Holy Cross Boys had a not-so-secret weapon of their own. Joe Elwood was the team's star striker in the cup run and would go on to become a top striker with Northern Irish league club Glenavon while still a teenager. He also played for the Northern Ireland youth team and he remembers one fixture and one opponent in particular. "We went to London to play England and we played at Leyton Orient's ground," he recalled. "I started off well, scoring two goals. "But then Jimmy Greaves got going and England trounced us 6-2." Though beaten, the game soon took on added significance for Joe. "Getting on the coach after the game, someone from Orient approached me and asked me to play for them." Elwood joined Orient, based in east London, in 1958 as they were enjoying one of the most successful periods in their history. In 1962 he was part of the side promoted to division one of the league championship - now the Premier League. They finished runners up in Division Two - now the Championship - to Liverpool, managed by a certain Bill Shankly. Elwood also got to play against his schoolboy hero Stanley Matthews when he played for Orient against Stoke City that season. But it was at Solitude in the 1954 Schools' Cup final that Joe first proved his talent. He scored both Holy Cross Boys goals in the 2-1 win. "Played, as usual, on Easter Monday morning at Cliftonville before a crowd representing gate receipts of £207-11-6," Gerry Maguire wrote in his diary. "It was a great day altogether and our lads certainly deserved their win. "Both teams were entertained to dinner at the Gaumont restaurant and were guests at the inter-league game at Windsor Park in the afternoon." But where did the bread come in? Paddy McLaughlin's father used to tie a ball on a rope around a beam on the ceiling of the family's house so that Paddy - who later became a Northern Ireland schoolboy international - could practice jumping for headers. But sometimes there was no ball so Paddy and his dad would have to improvise. "The woman next door, they had a big family," he recalled. "At holiday time, when the bread servers weren't going to be out for a couple of days, she brought tickets of bread home - these were like four loaves of bread all stuck together, not sliced. "When the bread became too hard, my dad would put a hole through it and use it as the ball to practice headers. "The place would be filled with crumbs."